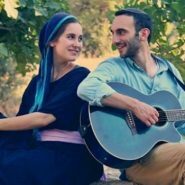 I discovered this sweet husband-wife singing duo, who call themselves “Yonina,” before Pesach, and since then I have become a big fan! This song below is about the happiness and meaning and passion we can discover in our lives through living a life of mindfulness, savoring each “rega mechuvan”–each moment of our lives with kavana. Tonight we will be celebrating Moriah’s bat mitzvah with friends and family–praying to not get bogged down in the multitude of details I’m juggling but rather to be able to experience and be uplifted by the great joy of this event–each rega mechuvan, IY”H! Thank you for sharing this wonderfully uplifting and inspiring song, and mazal tov!!! their music is beautiful! but i am just curious -what does she do about kol isha? I wonder if it has something to do with the fact that she only looks at her husband throughout the video and doesn’t interact with the camera/audience. Love this song. I’d love to get a copy of the lyrics and chords so that my husband can hear it too. Anyone know where I can get them?